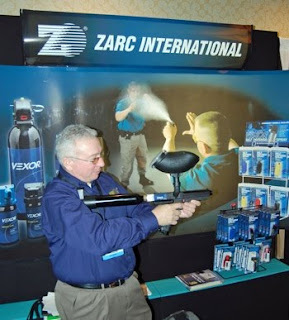 Tiberius Arms, manufacturer of the T4, T8 and T9, is also a supplier of less lethal pepper ball launchers. 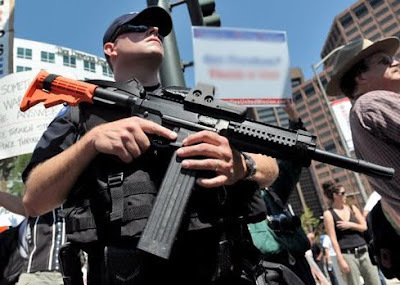 Their less lethal products are licensed under several brand names, such as Veritas and Zarc, and are proliferated amongst several law enforcement agencies in the United States. Tiberius isn't the first company to do this, Tippmann has been making pepper ball launchers for many years now, but it is interesting to see paintball markers that were made to replicate the look and feel of real firearms used as legitimate less lethal weapons. What's even more interesting, is that some of these less lethal launchers are retailed for less than their recreational equivalents. There was a recent flood of forums posts when some members of the paintball community found less lethal T8s retailing for $100.00. It has yet to be found if these launchers are able to fire at a safe velocity for recreational paintball (< 300 fps), but the consensus was that the deal was certainly worth it.